Spindrift2 heades to the Jules Verne finish. The warp factor speeds that the latest generation maxi multihulls can reach is hard to conceive of even for experienced performance sailors. For example the fastest offshore sailboat in the world, the French 130-foot trimaran Spindrift2, covered 908.2 nautical miles in one day in its previous incarnation as Banque Populaire V. That’s an average of 37.84 knots for 24 hours nonstop—a speed that many powerboats would struggle to achieve. This same boat also set the present Jules Verne Trophy record in 2012 with a time of 45 days, 13 hours, 42 minutes and 53 seconds, sailing around the world nonstop for 29,002 miles at an average speed of 26.51 knots. 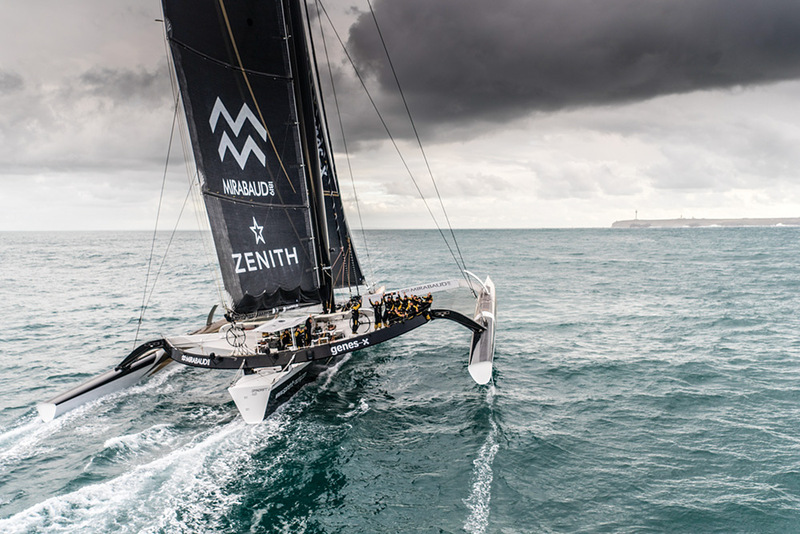 Four years later, this maxi-trimaran is now named Spindrift2, part of the racing campaign led by French multihull sailor and former Olympian Yann Guichard and his partner Dona Bertarelli, sister of Swiss America’s Cup winner Alinghi team owner Ernesto. Last fall Spindrift2, along with maxi-trimaran IDEC Sport skippered by singlehanded round the world record holder Francis Joyon, set off in the quest for the Jules Verne Trophy. Both boats zipped to the equator, Spindrift2 covering the 3,560-mile passage in five days, averaging 30 knots and nearly a day ahead of the record. This advantage evaporated as the giant trimaran was held up in light winds off Brazil. Spindrift2 was able to keep time with the previous record, passing South Africa’s Cape of Good Hope on Day 12. Into the Indian Ocean, the crew was forced to detour north to avoid ice and was further slowed by damage to the lifting foil on the boat’s port float. This was followed by unnaturally light conditions crossing the Pacific, causing Spindrift2 to fall behind the record. Her crew turned this around during the last 48 hours in the Pacific and on Day 30, as they passed by Cape Horn, they were 534 miles ahead of the record. The crew celebrates a record time to Cape Horn. But this would be their biggest lead on this Jules Verne Trophy attempt. The South Atlantic once again didn’t smile on them. After twice being becalmed, plus several days slogging upwind, as they crossed the equator on Day 39, the advantage they had held at Cape Horn had become a similarly sized deficit. In theory this could have been recovered in the North Atlantic, but the Azores high blocked their path, forcing a massive detour west. This, plus storm-force conditions as they turned their bows toward the finish line off the island of Ouessant off France’s northwest tip, caused the record to slip through their fingers. They completed their circumnavigation in 47 days, 10 hours, 59 minutes and 2 seconds at an average speed of 25.35 knots, nearly two days off the record. Despite their disappointment, the Spindrift2 racing consoled themselves with recording the second fastest time around the planet and proof that they have what it takes. Only once in the history of the Jules Verne Trophy has a new team broken the record on its first attempt, when Bruno Peyron and the crew of Commodore Explorer first set the record in 1993 of 79 days, 6 hours with an average speed of 21.12 knots. 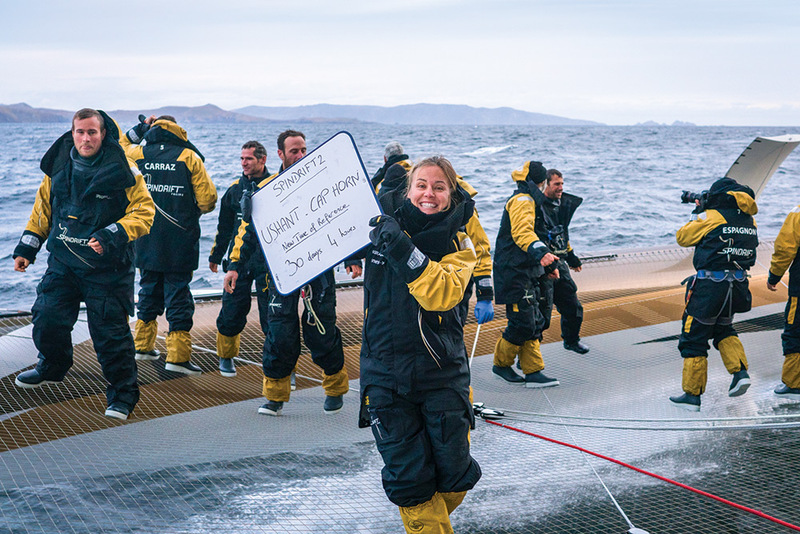 There was one record set aboard Spindrift2: Bertarelli became the fastest woman to sail around the world. Having raced multihulls on Lake Geneva for almost a decade, she helmed, stood a watch and wrote a compelling daily blog about life on board. 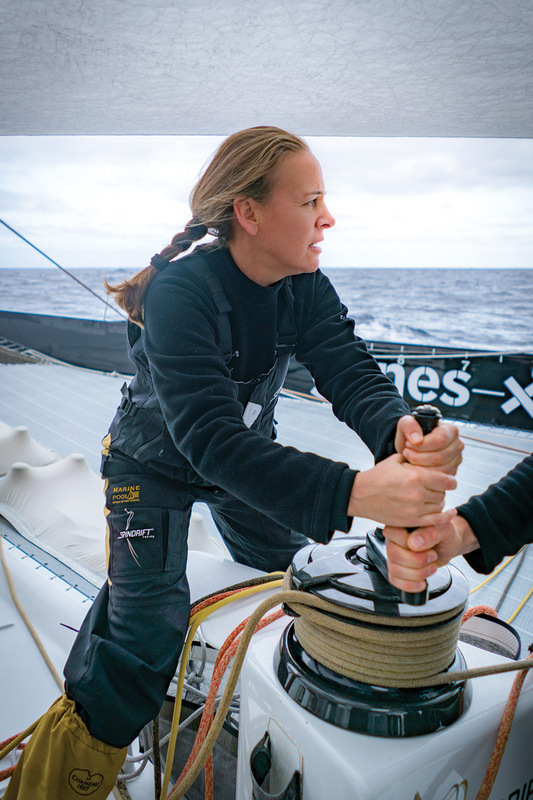 Dona Bertarelli gives the winch a spin aboard Spindrift2 on her way to becoming the fastest woman circumnavigator. For Bertarelli, who co-chairs the Bertarelli Foundation, a philanthropic organization focused on marine conservation, the trip was eye-opening. In addition to her work running several large hotels in France and Switzerland, she said she found leaving her two children was the hardest part of the journey. She had already spent considerable time sailing the boat during training as well as setting a new Route of Discovery transatlantic record between Cadiz, Spain, and the Bahamas and scoring line honors twice in the Rolex Fastnet Race. While racing a 130-foot-long and 75-foot-wide oceangoing trimaran might sound terrifying, it is generally not as grueling day to day as racing a Volvo 65. “When you go around the world on Spindrift2, you’re probably on the best, safest machine that you can possibly be on, one that is really made for the conditions you’re going to encounter. It was built specifically for this record, with the big waves of the Pacific in mind and protecting the crew as much as possible,” she said. Unlike the Volvo Ocean Race boats where crew sail in open cockpits, Spindrift2’s crew is protected in its cockpit by a beam across the trimaran’s transom. They also trim from inside a sizable cuddy that also protects the grinding positions. In addition, Spindrift2 was designed by VPLP with giant bows that provide buoyancy forward. There is a curved, retracting foil in each float and this, plus a wingmast that can be canted up to weather, go a long way to prevent the leeward bow from burying. These features all mean the chances of pitchpoling Spindrift2 are slight. The sheer speed of the boat is also a safety feature. “Spindrift is so fast that you can actually get away from stormy conditions, or from any kind of conditions that you don’t want to get into,” Bertarelli said. Navigator Erwan Israel worked closely with shore-based routing veteran Jean-Yves Bernot, but even they were unable to avoid some of the near park-ups Spindrift2 experienced, although even the slightest zephyr is enough for this giant multihull with her 138-foot-tall wingmast to sail at double digit boat speeds. While it may be built for the job, living on a 130-foot trimaran is still far from easy, but, like living next to an airport, you get used to it. “The noise is constant and very loud,” Bertarelli said. “When you’re inside the main hull, you think there’s a war going on outside and that the boat’s going to break every five minutes. The noise can be very stressful. While they were unlucky on this occasion, Spindrift2 is set to go on standby next winter for a fresh attempt on the Jules Verne Trophy. Bertarelli says she’s unlikely to be on board, but is equally aware that this may just be her reaction, coming so soon after the voyage.